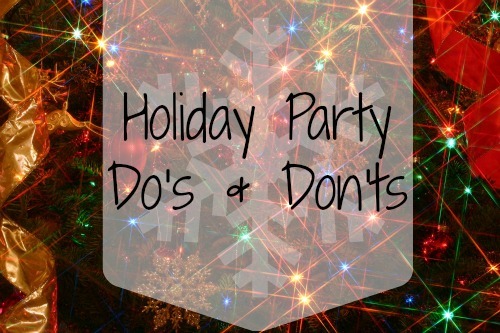 Hello Wench: Work Holiday Party Do's & Don'ts! DON'T party until the early morning. DO have a cocktail, or two. (limit yourself) And have a big glass of water between drinks. DON'T get so drunk that you are water cooler talk the next day. DO mingle with your coworkers - and introduce yourself to others in different departments! A handshake can do wonders. DON'T spend the whole night on your phone, put it away! DO dress appropriately and check the dress code before arriving. DON'T show up to the party in your club clothes (ladies AND gentlemen). DO keep conversations light and happy and show interest in others. DO be sure and see if spouses/significant others are invited. DON'T bring a guest if it's not allowed. DO appoint a DD or call a cab if you plan on drinking.